Monsanto's history with a controversial and dangerous class of chemicals known as PCBs, or polychlorinated biphenyls, has once again reared its ugly head. On the same day that the agribusiness giant announced plans to set aside a whopping $280 million in PCB personal injury settlements, a study from scientists at the Harvard T.H. Chan School of Public Health found that up to 14 million students in 26,000 schools in the U.S. could be exposed to unsafe levels of the highly toxic chemicals even though they were banned several decades ago. Before switching its operations to agriculture, Monsanto was the sole manufacturer of PCBs from 1935 until 1977. The U.S. Environmental Protection Agency (EPA) banned PCBs in 1979 due to its link to birth defects and cancer in laboratory animals. PCBs can have adverse skin and liver effects in humans and can also linger in the environment for many decades. The Harvard study noted that PCBs could still be leaching from caulking, sealants and other aging building materials and fixtures in elementary, middle and high schools across the nation. "Decades after the PCB ban, people are still being exposed to these toxic chemicals from various sources, such as caulk, some oil-based paints, and floor finish in buildings constructed between 1950 and 1979; leaking fluorescent light ballast; old electrical equipment; and PCB-containing landfills. Most worrisome are PCB exposures for children in schools built or retrofitted during the period that PCB-containing materials were widely used. Up to 14 million students nationwide, representing nearly 30 percent of the school-aged population, may be exposed to PCBs in their schools, based on the estimated number of schools built during that time and how much PCB-containing material was used in these schools. A 2016 Harvard School of Public Health study estimates that between 12,960 and 25,920 schools have PCB-containing caulk"
The report—The ABCs of PCBs—was released on Wednesday by U.S. Senator Edward Markey of Massachusetts, the Environmental Working Group (EWG) and America Unites for Kids. "That number comes by looking back at those periods of time where public schools were most extensively built. About 60 percent of the schools were built from 1950 to the early '80s, the time when PCBs were most commonly used in building materials," Robert Herrick, primary author and researcher at Harvard School of Public Health, said at a conference call. "It's a reasonable estimate. There's never been a national survey." "PCBs are some of the most toxic and persistent chemicals ever produced," said Ken Cook, president of EW. "It's shocking to find that while they were banned decades ago, millions of kids and other Americans continue to be exposed today." According to the Washington Post, people can be exposed to PCBs simply by touching contaminated substances, eating contaminated food or breathing in PCB-laden dust. 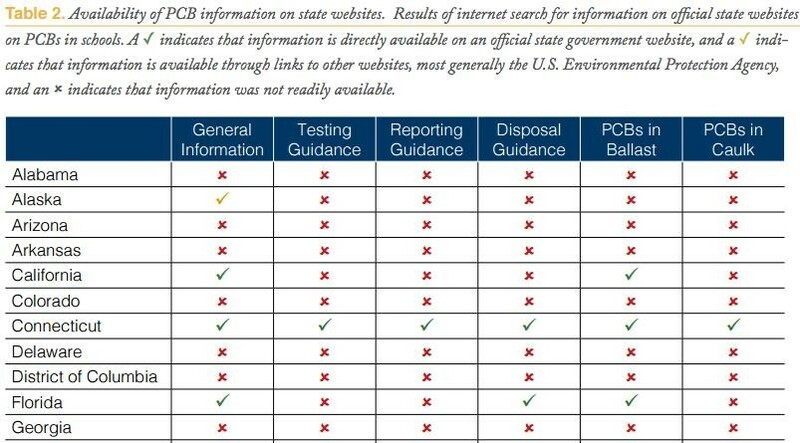 The new report includes a chart for each state on the availability of PCB information (or lack thereof) on state websites. At some schools in Malibu, California, PCB concentrations were thousands of times higher than the federal limit. "Parents have the right to know what their children are being exposed to in school," America Unites for Kids founder Jennifer deNicola founder told the Post. DeNicola, a parent living in Malibu, California, filed a lawsuit against the school district over PCB contamination. As it happens, supermodel Cindy Crawford pulled her two children from Malibu High School over the issue. She has since become a spokesperson for America Unites for Kids. "Millions of our students are likely spending significant hours each week inside classrooms that expose them to extremely toxic chemicals that could cause serious health problems for them," Crawford said. "Unfortunately, as these findings show and by our own personal experience in Malibu, the government agencies have very little information or answers for parents and teachers. Schools and classrooms should be healthy places where our kids are safe and able to flourish, not environments that could put them at risk." Last month, a federal judge ordered the Malibu school district to remove PCBs from its schools by Dec. 31, 2019. Proper removal of PCBs in public schools across the U.S. could cost between $25.9 billion and $51.8 billion, the report estimates. Sen. Markey said in a conference call that while the EPA is currently inspecting schools for PCB contamination, it could take 32 years to check schools across the country for the chemicals. According to the report, schools in New England have reported the most cases of PCB contamination. However, as Markey pointed out, "schools do not test for PCB hazards, and are not required to do so." "And when PCB contamination is found, no one has to report it to the EPA ... To put it plainly, we have no real idea how many students are being exposed to PCBs in their classroom each and every day," he said. The report's supporters are calling on the EPA to survey school systems nationwide and update its records to better assess the scope of potential PCB hazards in schools. They are also calling on the source of PCB exposure be eliminated from our nation's schools. Meanwhile, in a Wednesday press release for its fiscal year 2016 results, Monsanto said it was setting aside money for PCB litigation. "Selling, general & administrative expenses increased, primarily due to the $280 million in PCB litigation settlement costs associated with a group of legacy PCB personal injury claims," the company said. "In September, after diligent efforts, the company reached an agreement to potentially settle all the legacy PCB personal injury claims, including those on appeal. The settlement and final payment amount will be contingent upon the level of claimant participation, which the company anticipates will be met at a very high level." Monsanto has already had to face the music with its controversial chemical. In May, a St. Louis jury awarded three plaintiffs a total of $46.5 million in damages in a lawsuit alleging that Monsanto and three other companies were negligent in its handling of PCBs. The lawsuit claimed that Monsanto continued to sell the compounds even after it learned about its dangers and falsely told the public they were safe. Indeed, internal documents have surfaced showing that Monsanto knew about the health risks of PCBs long before they were banned. A document, dated Sept. 20, 1955, stated: "We know Aroclors [PCBs] are toxic but the actual limit has not been precisely defined." Several cities in the West Coast have also initiated lawsuits against Monsanto over PCB clean-up costs.